Unless you've got small children, or work with small children, the chances are that you have never heard of the term 'schema'. 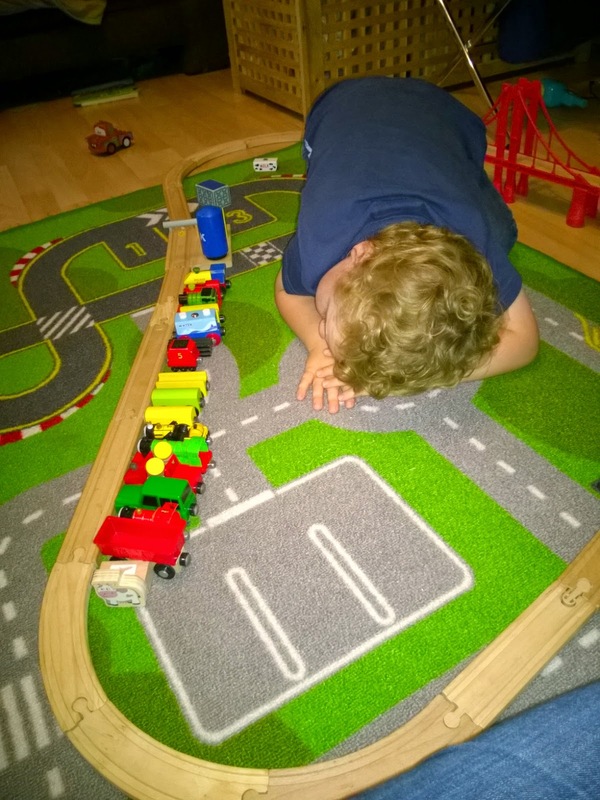 I certainly hadn't until I started looking into why it was that Ollie as a toddler was lining up all his cars in order, grouping the same colours together or doing it in order of size. A schema is a type of action that your child prefers to carry out and will repeat often. It doesn't mean that is the only action they perform, just that it is something they enjoy. Schemas are in some ways comparable to the idea of 'preferred learning style' that you may be aware of if you have, or teach, older children (for example 'she is predominantly a visual learner', or 'he has a kinaesthetic learning style'). This week we covered schemas in the PACT (parents and children together) course that I am on, so I thought it was a good time to share some of the basic ideas about what types of schema there are and how you can use knowledge about your child's preferred schema(s) to support their play. 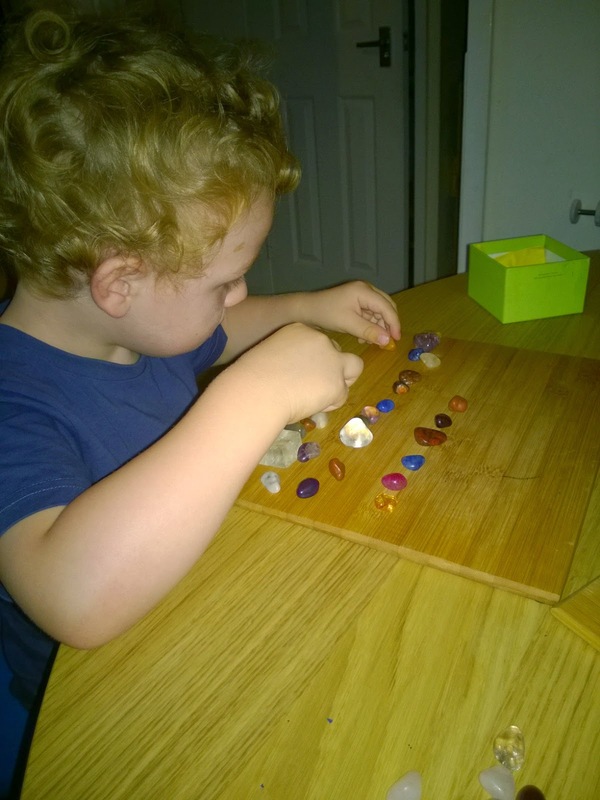 These photos are from some of the ways Toby demonstrated one of his favourite schemas. According to some sources, including my course on Monday, the behaviour he is demonstrating is part of the 'Trajectory' schema where children enjoy throwing things, shoving cars and balls along the floor and anything moving in straight lines, such as playing with running water. He doesn't only do these preferred schema related activities, and as a parent it wouldn't be right for me to obsessively only provide toys and opportunities that matched this schema, but it is nice to be aware of why little ones do certain activities over and over again and consider it when I pick out activities. Providing trajectory schema children with opportunities to play with running water, kicking balls with them, and throwing bean bags into a waste-paper basket are all ways of making a connection with them by playing in a way that they understand while at the same time helping their development. Depending on the source you look at there are different numbers of schemas, but this nice website Nature Play gives ten examples. This website would define the activities Toby is demonstrating as a 'Positioning' schema. We show preferences for schemas before our first birthdays and often carry them with us into adult life - the first thing I did in my exam last week was to line up all my pens and pencils neatly on my exam desk, so perhaps I was a positioning schema fan myself as a child? Do you have a child who likes to hang upside down from play equipment? According to nature Play this is the 'Orientation' schema. Objects to manipulate and opportunities to play with their whole body climbing and swinging would be things an Orientation schema child might enjoy. I found a useful PDF free to download from an organisation called NDNA which gives examples of schemas and how to support them. One of the schemas they refer to is 'Rotation' which is apparent in children who enjoy spinning around, turning the wheels on toy cars, playing on roundabouts. Did you have a baby who sat watching the washing machine go round? Then rotation might be one of their preferred schemas. The NDNA PDF suggests providing them with lots of round objects to explore, including clocks, balls and wheeled toys. Both my boys enjoy lining things up, but they also both enjoy moving things around - usually in a toy pram, wheelbarrow or bucket. This is part of the 'Transportation' schema and we found that providing containers for moving things around, plus lots of small objects to put in them, made for good games. For example playing shopping and using a basket to carry objects from one sofa (the 'shop') to the other sofa ('home'). I also use this schema to get the clean washing put away because the boys enjoy charging to and fro with socks and t-shirts to put away in their drawers, rushing back to me before I've finished folding the next item. It helps me, but more importantly they have fun and it also supports their skill in grouping items and feeling good about being part of the running of the household. It did backfire one time when Toby was just turned two and diverted from putting socks in his drawer to stuffing them in the toilet! In many respects the boys have shown similar preferences in schemas, but they also have their own individual styles. Both boys for example enjoy the 'Connections' schema, building train tracks and megablock structures, but we all found Ollie's preference of the 'disconnect' element of this schema frustrating. Insistence that you build a train track or building for him, only for him to smash it apart so you build it again may have been a natural part of his learning, but it was also really irritating for us as adults, and devastating to Toby when he came on the scene and started demonstrating that he loved the 'connection' part, patiently building miles of tracks or amazing towers. Fortunately as he has got older Ollie has become more constructive than destructive. He wasn't being 'naughty', it was just he enjoyed the 'oh no, here comes a disaster' game, but nevertheless I am quite glad to see it taking a backseat to other interests. Another schema is 'Transforming', where children enjoy watching changes. You can support this by doing kitchen chemistry experiments such as playing with home made indicator solution and adding vinegar and bicarb to watch the colour changes (boil red cabbage and the resulting liquid is a great indicator solution), or mixing paints together to see what happens. Even exploring an ice lolly as it melts in their mouth is a great way to demonstrate transformations. The final two schemas on the NDNA PDF are 'Enveloping and containing' and 'Enclosing', which have similar elements. Enveloping and containing seems to refer more to enveloping themselves - playing fancy dress or making dens for example, while enclosing is more about putting items in boxes. These are also favourite play activities for the boys, they love to roll on the floor wrapped in a blanket, hide objects or each other under fabric, hide in the same spot over and over during hide and seek, squeeze into small spaces or repeatedly fill and empty containers. You may see this in yourself as an adult if you like to draw boxes around the things you have written, or your favourite season is Winter because you can wrap up in layers. As you can see from the examples of my own boys, kids do not only display one type of preferred behaviour, but they can seem to be obsessed little creatures when they do perform the same action over and over again. In our times of over-diagnosis of behavioural abnormalities for every action that we observe I thought it was important to write about schemas however so that they can be seen to be just another normal, and in fact necessary, part of how children develop and that if you are a new parent watching your little one line up the peas on their plate they are neither a genius nor an obsessive compulsive nor autistic, they are just a little kid doing what little kids do who like the positioning schema. And if they prefer to throw train tracks than build them, they don't have ADHD, they are just preferring the trajectory schema to the connections one. The best we can do as parents is to get down on the floor with them and provide varied opportunities for play but perhaps with schemas in mind, such as directing the large heavy object throwing towards something equally fun but less painful such as bean bags.